If you are looking for one of the best super automatic espresso machines under $1500 to put in your kitchen then stay away from commercial machines – yes, they are awesome but they are designed to produce hundreds of shots of espresso every day. For the every day home user you don’t need anything designed to do that kind of volume and you can save quite a few dollars staying away from commercial models and sticking to the top of the line versions made for non-commercial use. Another thing to keep in mind is that home espresso machines are made to be just as good as commercial units although they may not be capable of pulling shot after shot all day long without sacrificing some longevity. Although their price tags are lower don’t assume the quality of shot is lower – there are some amazing machines available at this entry point and if you want something automatic that will do it all then this is the list for you. 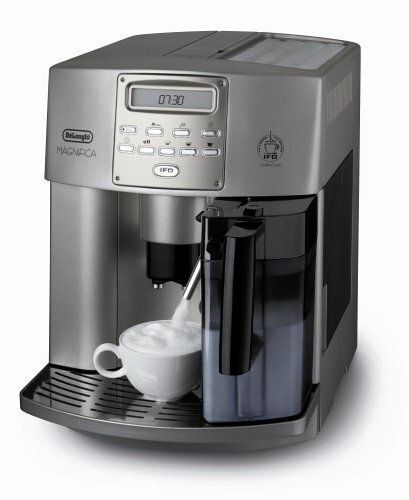 Below I’ve filtered out the chaff and hand selected the best fully automatic espresso makers in the sub-$1500 category. Here is the list of machines and if you need more info be sure to scroll down a bit where I have opted to include small reviews of each unit for your information. Now, let’s dive in and review these espresso machines and see what sets them apart… let’s see which one is right for you. It’s easy to make a list and say these are the best (or only) options but the details are what make reviews so helpful. I’ll skip the obvious in the following reviews and only tap into the points of differentiation that should matter to most shoppers. As you would expect and want this model has an integrated conical burr grinder that operates in lockstep with the brew process. You basically hit the start button and the beans grind, does, and brew exactly to your liking! The espresso maker itself heats water efficiently and brews at a full 15 bars just like traditional machines so you shouldn’t be able to tell the difference between the espresso this machine makes and any other dedicated espresso maker. The attached frother can make really nice tight foam which is nice but my favorite feature is the coffee spout which can be lowered or raised depending on the height of the mugs you brew into. This keeps things much easier to keep clean! See pricing and specs on Amazon here. This is another automatic espresso maker that grinds your beans, doses, and tamps your grind. I particularly like the automatic disposal of spent grind and the removable water reservoir is really easy to use. There are also a few more buttons to press on this unit but many people dislike the combination dial/button found on other models like the Jura featured above. 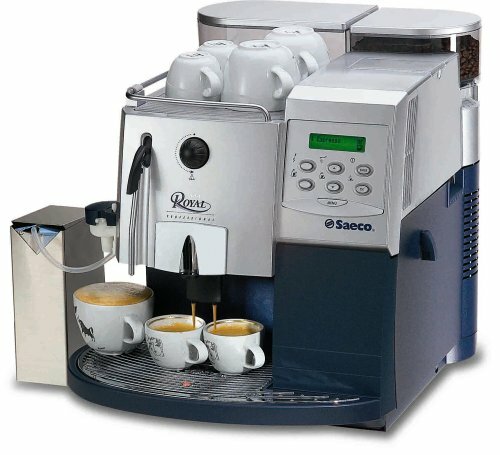 This is another top of the line super automatic espresso machine that grinds beans and brews at the touch of a button. For me its selling points have everything to do with the integrated on-board storage for your espresso cups and the ease of cleaning out the spent grind. With all coffee products dealing with used grind is always the part that is the messiest and this machine makes it easy. 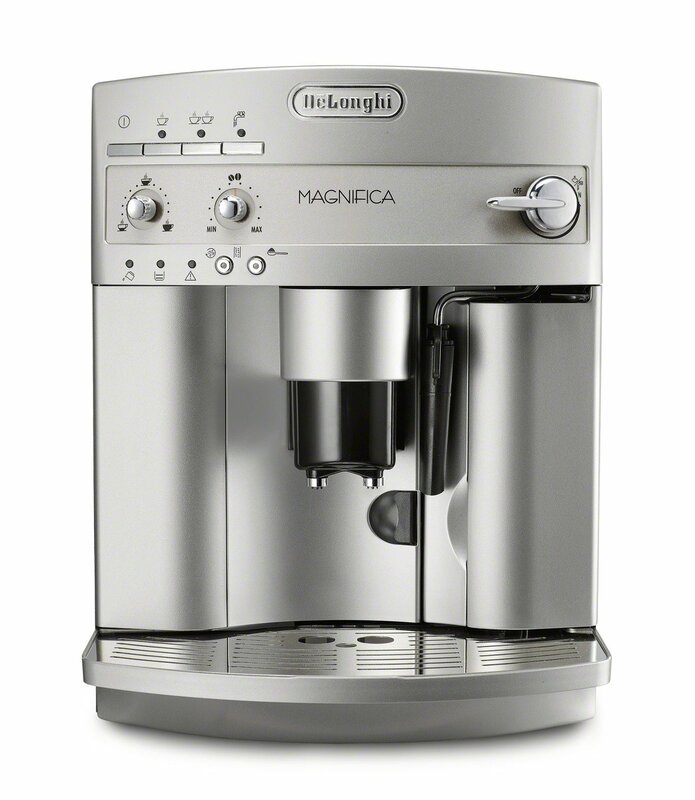 The Magnifica’s built-in burr grinder can be fine tuned to your liking easily. Instead of just going with a built in espresso grind setting this machine lets you choose to grind your beans smaller or larger depending on your preferences. 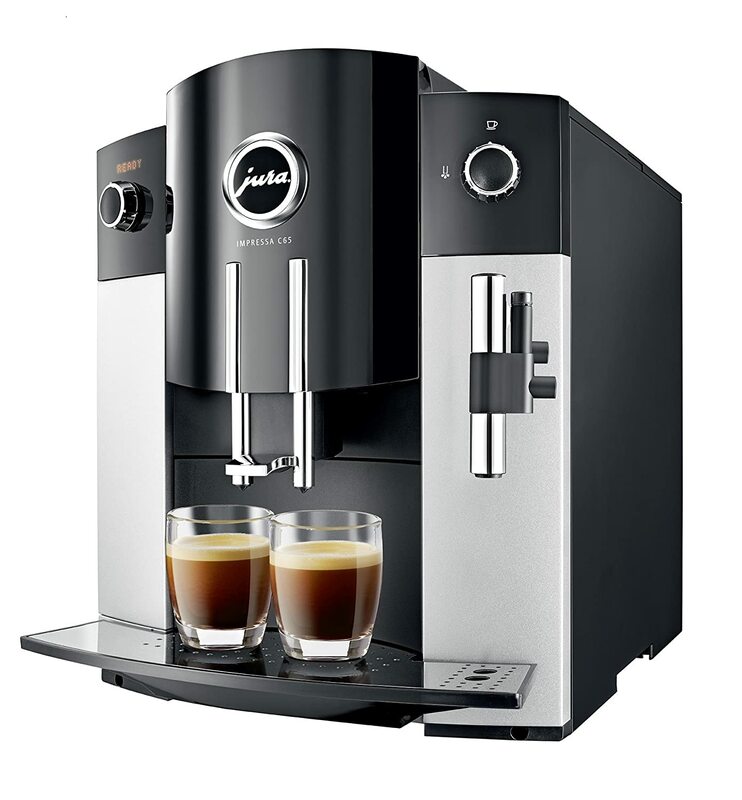 It’s also got on-board storage for milk so you can easily prepare your milk based espresso drinks like cappuccinos and lattes without digging into the fridge for every cup. This push button espresso machine is a great bargain because it does everything with relative ease and for a lot less money than some of the other options. It’s also one of the easiest to keep clean and maintain which is a huge deal for anyone living in a busy house full of other routine maintenance and cleaning chores. 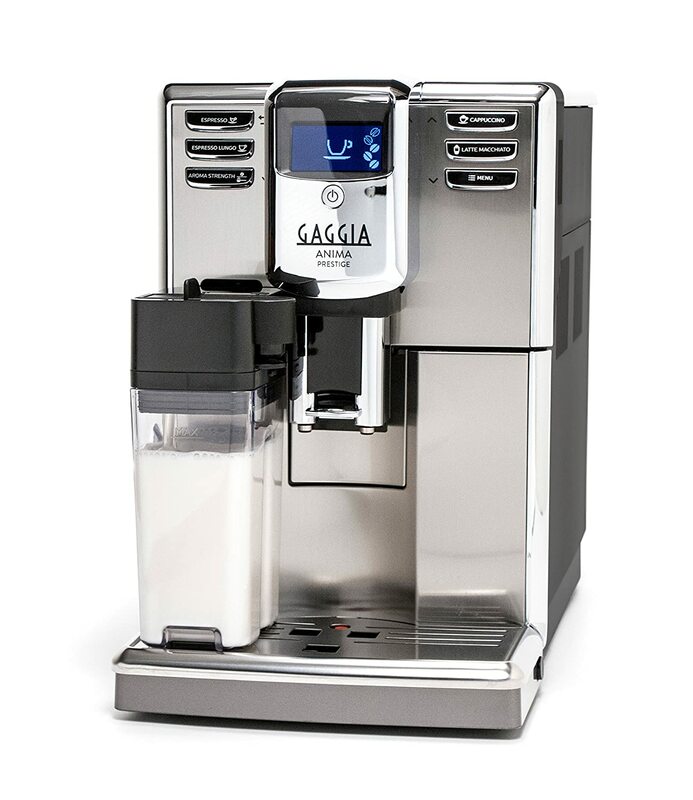 Lastly, this Gaggia is a great middle of the road option for people who want their machine to do it all. 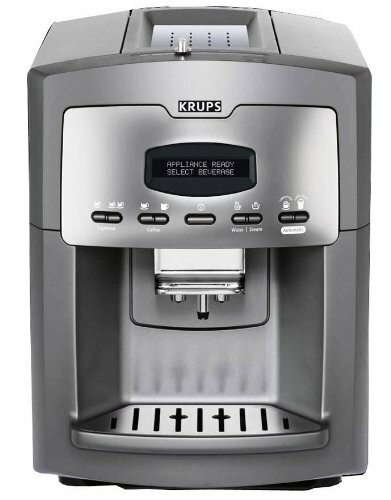 It has a bean hopper and water reservoir that won’t require you to refill it every couple of days and the mixed milk drinks are easy to replicate day in and day out because this baby is programmable! Just set it up to make the drink of your liking and it will do it. Set a program for you and another for your spouse and you’ll both be happy! If price isn’t that big of a deal there are some fancier models out there but I’d encourage you to look to the lower end where your the units will be priced best for your money. You can see our page dedicated to top of the line super automatic espresso makers here.